Mama Lou's is a casual dining restaurant that offers Italian, French, American and fusion dishes. Most of their ingredients are sourced abroad to achieve authentic flavors and give guests a delightful dining experience every time. Mama Lou's actually originated in the South, its humble beginnings was in BF Homes Las Pinas. A house turned into a restaurant where the owner is a Canadian with Italian and French roots. Thus, the very obvious homey experience both for the restaurant's ambiance and food. Complimentary Bread - bread in a cute basket with Pomodoro and Pesto-Olive Oil dips/spreads. This was a great way to start our appetites going but I only ate 1 piece just to warm up my tummy for the array of food that was about to come my way. Both dips/sauces were good and I really like the Pesto. 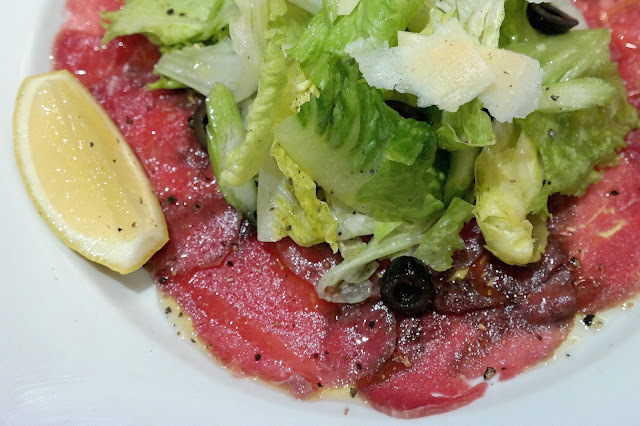 Carpaccio di Manzo - Thinly sliced raw beef filet marinated with olive oil and balsamic vinegar, topped with capers, olives, some greens and shaved Parmesan cheese. I love carpaccio and I know not all people like to eat raw meat especially meat just like beef. I think it's an acquired taste, but everyone should try it. This is the first time I ate carpaccio that served like a salad with all those greens. I usually don't put anything on carpaccio but this came with lemon so I squeezed that on the beef and the acidity of the lemon kind of cooked the beef, but still it tasted good. Mushroom Chicharon – crispy fresh Oyster mushrooms served with vinaigrette. At first you'll think they are chicharon bulaklak (deep fried crispy pork intestines) but they're actually mushrooms. Though they are deep fried they are still healthy... I think... hehe. It's good that they weren't greasy and they were definitely addicting. The vinaigrette served as the dip in replacement of the local vinegar that we are used to. I think they used Balsamic vinegar here and it was on the seriously sour side. Bacon Poutine - French fries topped with smooth brown gravy, mozzarella cheese and bacon pieces. gravy, mozzarella and bacon. Poutine is actually invented by the Canadians and the owner is a Canadian so no surprise this was on the menu. I'm not the biggest fan of French fries but this was actually good and something new to me which is nice to try it once in a while. Pizza Bianca – thin crust pizza topped with cream, Mozarella cheese, mushroom and bacon. Mama Lou's pizzas are served with arugula and alfalfa sprouts so you can eat them rolled like panizza. The pizza are great and filling with or without the arugula or alfalfa sprouts. But having those greens will somehow make the pizza healthy right? Quattro Formaggi Pizza – thin crust pizza topped with tomato, Mozzarella, Cheddar, blue Cheese and Brie cheeses. The crust of Mama Lou’s pizzas have perfectly toasted edges with nice and crispy bottoms. It had a really nice consistency, was not hard as a cracker and the top soft and spongy. This allows you to roll it with the alfalfa sprouts and arugula just like a panizza. The four cheeses and sauce on this variant blended well. The herbs sprinkled on it accented the cheese. Though this contained 4 types of cheeses, it was not too salty. Risotto Tartufo Funghi – Italian rice dish cooked in a broth to a creamy consistency with wild mushroom and truffle cream sprinkled with shaved Parmesan cheese. I'm not a person who would always go for the Risotto when I'm in an Italian restaurant even if this dish contains two of my favorite things in the world: rice and cheese. Don't be fooled, beneath that innocently bland exterior lurks an explosion of flavors. The rice grains were al dente; cooked just right with a little bite to it. It wasn’t like rice porridge that’s mushy or starchy. The truffle definitely gave it a robust flavor. I like how rich, creamy, cheesy and intensely savory the sauce was without being heavy. Vesuvio – mountain of Rigatoni pasta stuffed with Mozzarella, Ricotta, peas, Italian meatballs and egg. This dish was inspired by Mt. Vesuvius, a well-known volcano in Italy. The rigatoni pasta were placed upright to form something like a mountain and the sauce resembles as the flowing magma. Among all the types of pasta noodles, I have a fondness for Rigatoni because they look like jumbo tubular macaroni, cute and fun like jumbo crayons, if you get the analogy. The sauce was creamy and had a good mixture of sour and salty; also the pasta was al dente. Spaghetti Con Tuyo Filleto – spaghetti with dried salted fish fillets with freshly chopped red tomatoes, arugula, in garlic and olive oil. This is one of the fusion dishes at Mama Lou's and surprisingly my favorite. I seriously can't stop eating this, forkful after forkful. It looks so simple with the outburst of flavors: a nice blend of sweet, sour, salty, spicy and savory, something that took me by surprise. I love all types of sauces in pastas, but the oil-based ones doesn’t always satisfy me, so it’s good that this was a hit for me. Truffle Mac and Cheese – scrumptious and comforting original blend of cheeses and truffle cream over tender elbow macaroni, topped with melted Mozarella and cheddar cheese. Mac N' Cheese has an American origin but adding truffle to it makes it European, somehow, I guess. This was a crowd favorite and was definitely IG and Boomerang-worthy especially when scooping a spoonful and you see the Mozzarella cheese form strings as they get stretched. This was definitely heavenly, very rich and creamy and the truffle added an earthy flavor to it. Chicken Marsala – Chicken breast fillet layered with ham and Mozzarella cheese in creamy Marsala wine and caper sauce. Marsala is an amber-colored wine from Sicily and this chicken dish is delicious with all the Italian flavor you could possibly crave. With the cream sauce that topped this chicken dish it became an instant favorite with the very first bite. By the way, this can be ordered with mashed potatoes or rice, your choice. Rosemary Lamb Rack – grilled Grade-A New Zealand lamb rack with rosemary. Lamb is one of the meats that I love to eat even though most people don’t like it because its fat is often too saturated and its meat grainier than usual. This dish was flavorful, yes, but I found the meat to be a bit overcooked, as I usually like them medium-rare. It was also a bit hard to slice and chew & had more fat than actual flesh. It came with mashed potatoes and apple-mint jelly spread. Prawn Thermidor – simmered prawns in spring onion and brandy topped with a delicious creamy sauce. This is a simple and elegant dish that is super creamy and tasty. Based on my research most Thermidors taste stodgy and heavy, but this version is almost divine. Well, I wish they used the whole prawns instead of cutting them to bite-size pieces, but this is how Thermidors are like. Even then, I still like it. Take The Cannoli – home-made cocoa-Marsala shell filled with Italian Mascarpone cheese, chopped pistachios and chocolate glaze. At first I thought that the cannoli was over fried because of its brown color; not until I checked the menu and read that they used cocoa; thus giving it its darker than usual color. I love cannoli, they're my favorite Italian pastry ever since I saw them on Cake Boss and tried them. I love Mama Lou's version because the filling was sweet and creamy rather than on the sour side from most of the cannoli fillings that I've tried before this. Italian Tiramisu – layers of biscuits, whipped cream cheese, espresso and Bailey’s. I'm also a fan of coffee and anything with coffee and also Bailey's so I like Tiramisu. I loved that this is somewhat closed to the authentic one as this uses biscuits/lady fingers and they are softened by soaking them with all those cream cheese, coffee and Bailey's. It was so good that I wish the slice/serving was larger. Mama Lou’s Iced Tea – Ok, you might think why did i include the iced tea in this review/feature? Well, they are worth mentioning because this is one of the best Iced Teas I've ever tasted to date. I was curious when they served us these iced teas because when the staff was putting it on our table he really made the effort to mention that these are called "Mama Lou's Iced Tea". It was super refreshing and had an after-taste that tasted like mint or basil, I really couldn't tell but it was yummy. That's probably a secret ingredient so I never bothered to ask. All in all it was surely a sumptuous dinner and we truly enjoyed it. I was also glad to see these girls that I haven't seen in a while. 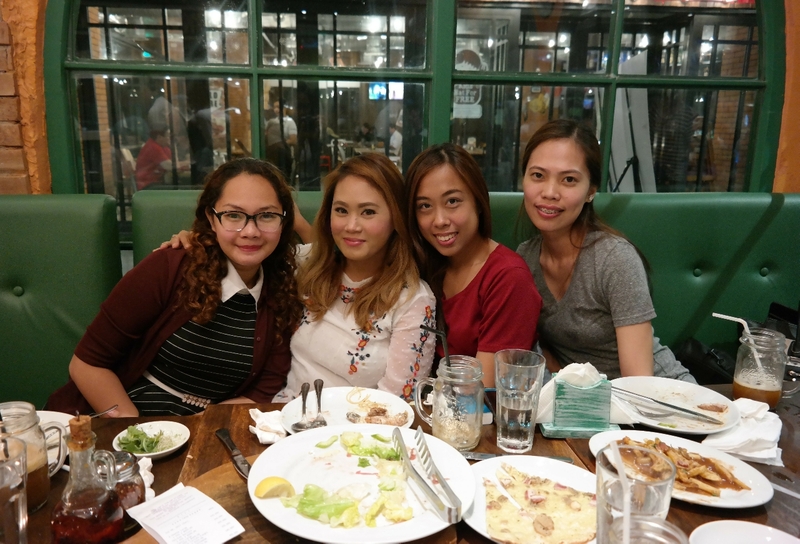 I am definitely going to visit Mama Lou's again and recommending it to friends and family.